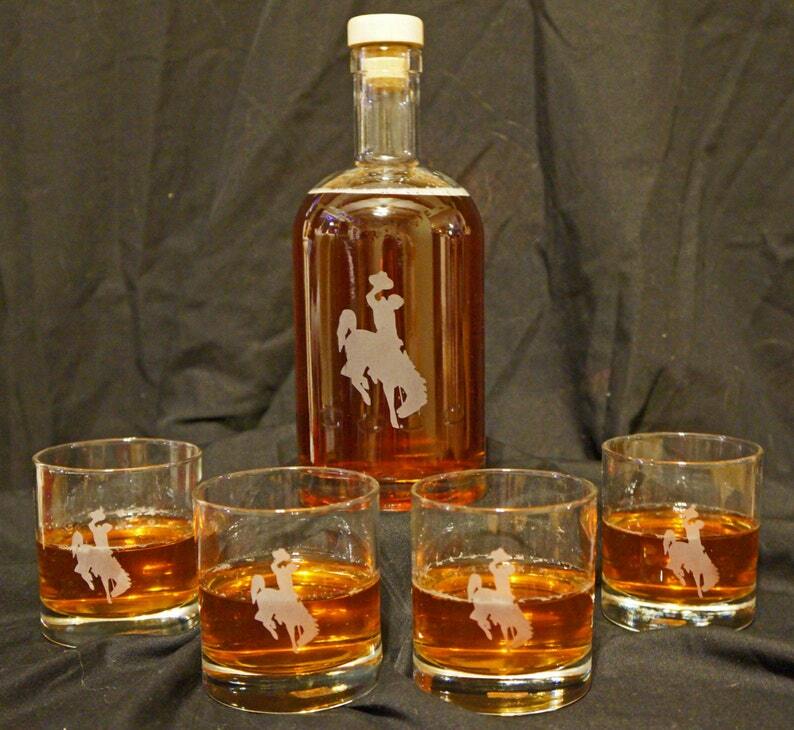 This hand etched whiskey decanter captures the spirit of WYOMING that fills every cowboy nation fan with passion. 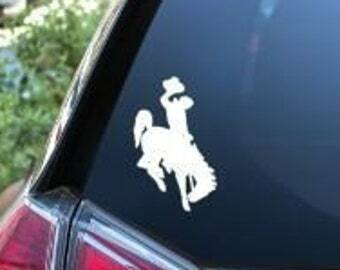 The Wyoming Cowboys are the very essence of what it means to be a University of Wyoming alumni and native of Wyoming. This whiskey set will help you rekindle the excitement found on the field right in your very own home. 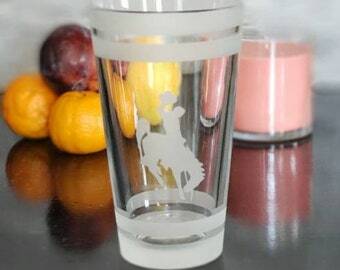 The iconic Steamboat is recreated as an expertly sandblasted etching on the glass resulting in a piece of cowboy home décor that will have you silently musing, “Go pokes” after every sip. 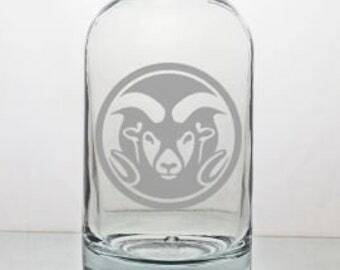 Offer your favorite Wyoming fan the chance to bring Steamboat into his/her home or office with one of our signature etched whiskey decanters with matching whiskey glasses. 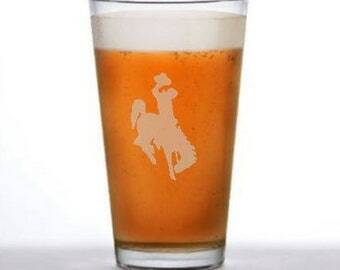 You may use the drop down menu to the right of this description to select your quantity of cowboy glasses ranging from no glasses (decanter only) to up to eight glasses. Each component of your whiskey decanter set features the expertly sandblasted image of Steamboat. We only use sandblasting for our etching as it results in superior images when compared to laser engraving. 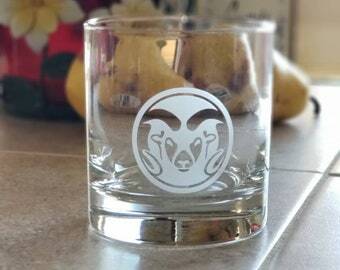 Laser engraved glass can result in small cracks and a fuzzy design whereas with our technique guarantes sharp images with one of a kind execution, and pieces that are dishwasher safe. You can learn more about our business practices and shop by reviewing our policy page and shop story respectively. Each order will be shipped via standard USPS Priority mail with an estimated 1 – 3 day transit time (after our 14 day creation time) but rush upgrades are available for a small additional fee. Very cool gift! Excellent packaging. Shipment arrived in perfect condition...quality product at an excellent price. Love it!! I am happy to accept all forms of payment accepted through Etsy including credit cards, Etsy gift cards and Paypal. Please be sure your address on file with your selected payment method is correct as that is the address your order will ship too. Due to errors with address changes after order placement I no longer will change the address for shipping after the order is placed. If you need the shipping address changed please request an order cancellation and place it again with the proper address. Sales taxes are collected for Wyoming deliveries only. Per Etsy guidelines, customers may only use ONE coupon code per order. I hold a no refund policy due to the nature of my products. Your item is created just for you. If there are errors on my part please notify me and I will correct it promptly. Proofs of work are provided and require your approval prior to work being done. Please take a few moments to check spellings and details carefully. The proof process is the time to indicate that you do not like the design. Once a product is created from an approved proof there will be NO REFUNDS. If items are damaged in shipment please contact me promptly (within 72 hours) so we can correct the issue. Standard shipping is via USPS Priority Mail for all products. I take extra care in packaging my products to ensure a safe delivery of all pieces. Therefore, you will find a variety of packing materials in your box upon arrival and I ask that you dig carefully to find all of your items. Due to the fragile state of glassware I also repurpose many of my packing products and I encourage you to do the same. If you would like your order shipped via UPS, overnight or other means please contact me prior to placing your order so I can be sure your shipping is properly quoted and the order is correct. If upon arrival there are items broken in your package please contact me via Etsy message (no phone calls please) within 72 hours of delivery and we can work out a replacement, coupon or refund. If I am not contacted within 72 hours of delivery I am not responsible for the damages and you will be charged for the replacement. I do not ship internationally at this time, thank you for understanding. Shipping charges are quoted by the USPS and are charged accordingly. I do monitor the charges to ensure they accurately reflect the actual charges to ensure you are not being charges significantly more than cost. The common turn-around time at Brought to you by Naptime is 14 days from order completion to shipping. This gives me some “fudge” room in case of illness, travels or family situations. I try very hard to get items out quicker on a regular basis so you can enjoy them as quickly as possible. Some items are in stock and go out the next day while others have to be produced and take a few extra days. If you need your item faster than the quoted time frame please contact me. I do charge a small rush fee for items that need to ship within 5 days of the order and offer an overnight shipping option for a small fee also. If your order requires a proof approval or clarification the turn-around time begins when ALL necessary items are received to produce the order without further input from you the customer. All proofs are created and send via Etsy Conversation within 7 days of your order. If you need your product by a specific date please let me know at checkout. Production time is also extended if I need to order product that is not typically kept in stock and you will be notified of any extension in shipping date. Unhappy customers are not something I strive for, so if you are unhappy with your purchase please contact me privately to work out a solution prior to leaving me negative feedback, I want you to LOVE your products as much as I love each piece. Upon receiving your order if you absolutely love it please let me know through feedback too. I am very generous with my customers, your feedback may have rewards. All items are either exclusively my design or I hold a commercial production license for them. As for the University of Wyoming designs I am a licensed producer of all trademarked logos and pay my royalties to them for the use and sale of products bearing these insignia.